Short story long, in 2015 whilst nursing a stress fracture of the second metatarsal I attended a coaching course paid for by the club which prompted me to start up Zero2Hero. I thought to myself that seeing as I would be easing myself back to fitness and because the club had paid for the course I should really put it to good use. I had also seen a News item one evening that was basically saying that the average person was overweight because they had no interest in undertaking any form of exercise and we were a lazy nation. I immediately thought this was a load of rubbish and that your average person would love to exercise so I thought I would challenge this because my belief is that people don’t exercise not because they don’t want to but because they either can’t afford the ridiculous prices gyms or personal trainers charge or that they simply have no idea how to go about getting started and that it can be quite intimidating. So enter stage left Zero2Hero, a free of charge couch to 5K to test the theory that in true fashion of the Kevin Costner film Field of Dreams that “If you build it, they will come” and come they did, in their droves. That first January evening in 2016 when some 60 people arrived at the club wondering what the hell they had let themselves in for was quite something, the same again in July and again the following January. However what these people have now realised is that what they let themselves in for was a journey of discovery, a challenge that only they could achieve for which there were no short cuts or short measures. Since starting Zero2Hero the club has gone from strength to strength. 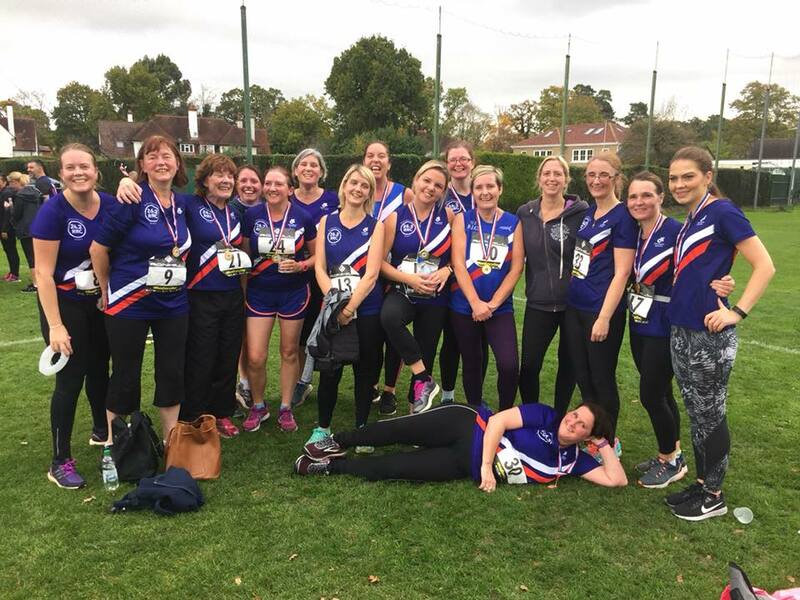 Not only because of those who joined after graduating but because of how it attracted runners of all standards, who heard about us through word of mouth or simply saw the incredible numbers we suddenly had running round Surbiton. Our foot print had suddenly increased as a result. 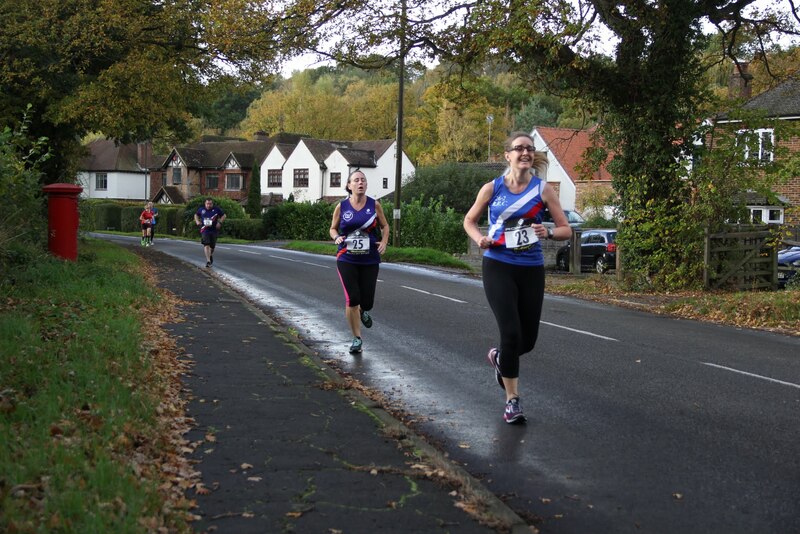 Then follows Hero2SuperHero, a 8 week 10K training program aimed at all club members which was taken up with so much enthusiasm from members of all standards that today at our target race the Oxshott 10K saw what was most likely in the time I have been a member, the largest mobilisation of 26.2 RRC members in terms of runners, volunteers and supporters. The team photo before the start was something to behold and I for one was extremely proud to be a member of and Captain of 26.2 RRC this morning. 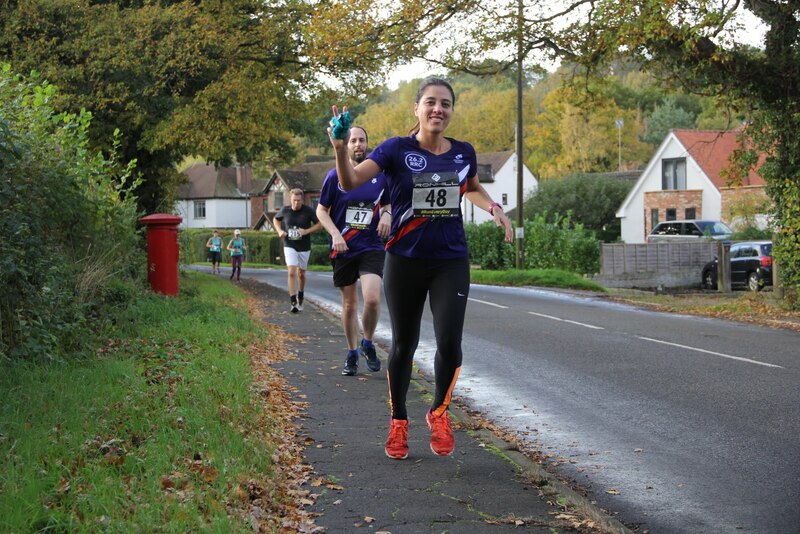 I have been looking forward to today’s race so much I was like a kid at Christmas this morning, I can’t remember the last time I was stupidly excited about running a race, even the North Downs Way 50 didn’t grip me like today did and I ran the first 5K on adrenaline alone this morning. But the one thing that excited me the most with the exception of running myself was to see so many of those who came in via Zero2Hero achieve what I knew they were capable of and finish that 10k. So enough of my rambling, on to today and first of all can I say that there shouldn’t be a single person reading this who ran that isn’t happy with their time today. There were some incredible times from Joe Chang who in 37:43 finished second overall, to Lizzie Wilson who was sporting Race No 1 this morning. Lizzie ran with a smile on her face the entire way, or at least that is what the photo’s suggest, it looks like she slept with a coat hanger in her mouth last night she was smiling so much! 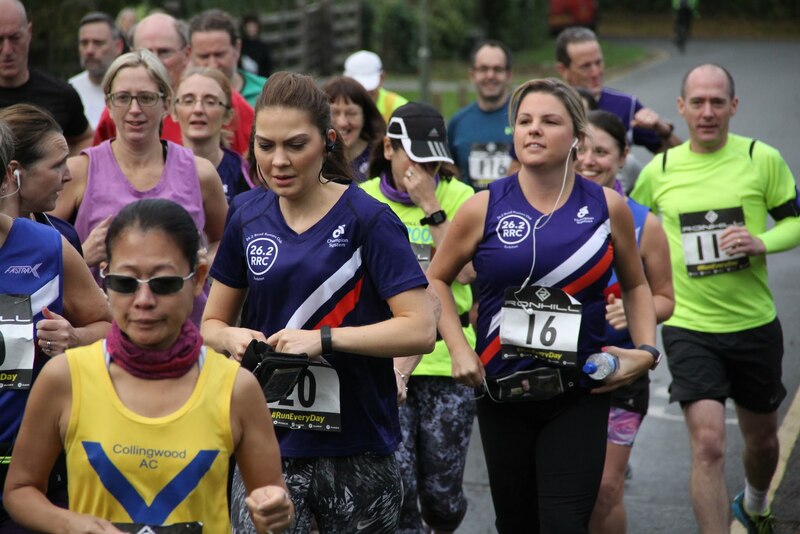 There were a staggering 63 runners from 26.2 today, in a field of 198 which means we made up 33% of the field, quite something I’m sure you’ll agree. However with so many people running it makes things very difficult for me to mention everyone but even though everyone ran so well there a few who deserve a special mention. Going through the field there were some great times near the front with Mark Canning going sub-40 having been dragged round by Steve Ramek and Anthony Wheelan. The two Matthews, Pritchard and Hoare pushing each other round for sub 46, Greg Whiteman who despite missing the start because he was too busy nattering to Derick Wilkie still managed under 48 minutes and Carla Cotton showed she is going from strength to strength finishing just behind him. 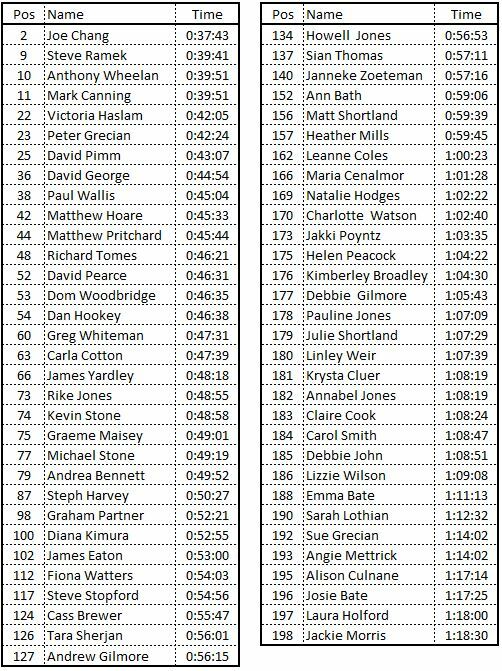 Rike Jones pushed and pulled me round to hit her target of sub 50 by over a minute closely followed by Graeme Maisey nursing a sore Hamstring. 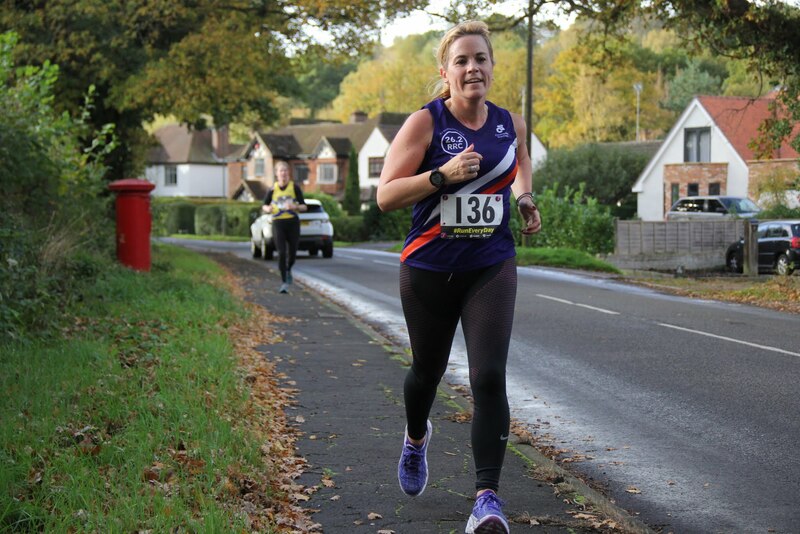 Andrea Bennett battled a stitch half way round to score her post Op sub 50 closely followed by Steph Harvey who smashed her PB finishing in 50:27. 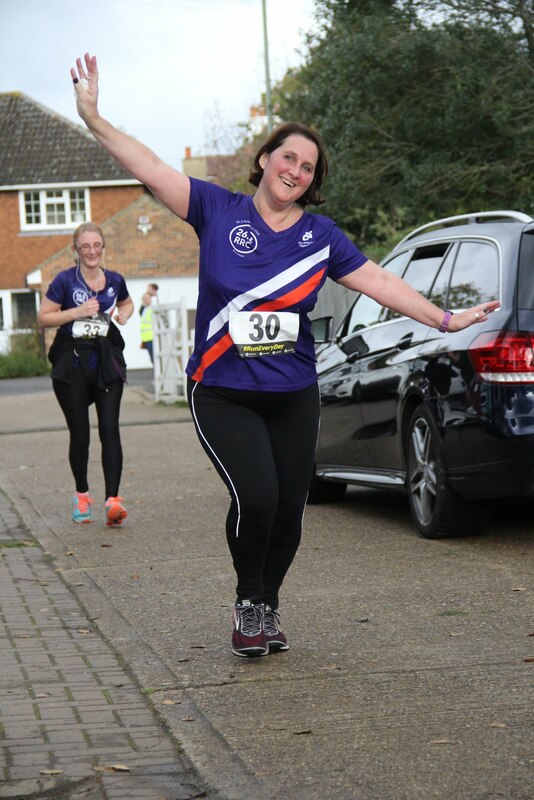 Fiona Watters who was a last minute entry and having done very little training also finished with a huge smile on her face smashing her estimate time closely followed by Steve Stopford who pushed hard to break 55 minutes. From there on in the field was mostly made up of those ladies from the GRINS more commonly known as the Get Round in Style group, the majority of whom were Zero2Hero graduates and for some of them their first 10k, every single one of them did themselves proud and ran a lot quicker than they expected. This just goes to show that you should never under estimate the difference training properly for a race can make, well done to you all, you made your captain proud today, you were all awesome. The best example of that last statement has to be from the lady who in my opinion had the performance of the day in the form of Cass Brewer. Although Cass couldn’t make all the training sessions I know from looking at Strava and from feedback from others that she followed the plan, ran on her own when she couldn’t train with the club and absolutely gave it her all today completing her 10k in 55:47 which I assume is a massive PB for her and a well deserved one too, well done Cass, I think the gurning face you pulled as you pushed for the line said it all, you worked your socks off. The award for ‘Best Achievement Of The Day’ has to go to Julie Shortland for finding her way round the course and not getting lost, even if she did almost turn right at the finish. The award for “Nutter of Day” goes to Sian Thomas, who only two weeks ago was being carted off the XC course by paramedics but still turned out today and run her little legs off. Well done to everyone who ran today, what a great morning. Apologies I couldn’t give everyone a mention, I could sit here and wax lyrical about everyone today but I haven’t got all night I’m afraid. For those who haven’t yet seen them Richard has uploaded a number of photos to the link below, take note of how much show boating was going on whenever the camera was pointing at Sue Grecian, I think she enjoyed her run today! There are some great photos among them so do take a look. And finally before I post the results I would like to say that with all the hard work many of you have put in over the past 8 weeks to achieve your goals today it would be great to see you all keep the momentum going and continue your training going forward as the step up from Hero2SuperHero is without a doubt only a small step in what I know you are all capable of achieving. The “26.2 RRC – We Is Runners” Facebook page will remain open for everyone to continue to organise Sunday runs or simply post up about your race results or photo’s so please do continue to use it. For those who didn’t get involved with the Hero2SuperHero program but who would like to join the page you can request to join using the following link and we’ll add you as a member as it is a closed group.